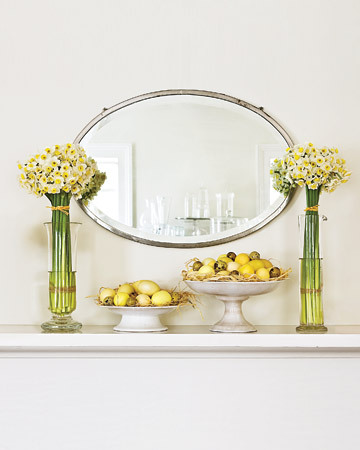 My mantel inspiration this year, was this photo from Martha Stewart. It is so fresh, balanced and uncluttered. All things I need my life to be more of lately. 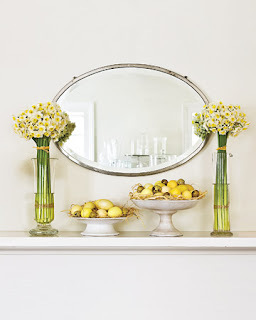 This meant I immediately needed to find a vintage mirror to hang on my mantel–not just for spring, but for all year, long. I was excited to find this beauty on Craigslist for around $35. It is extremely heavy, and definitely vintage! But that is what I was going for! 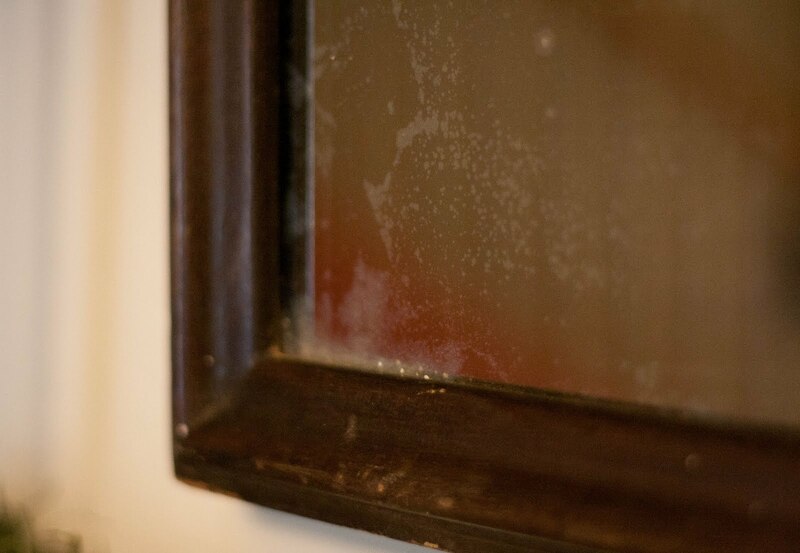 There are enough mirrors around this house for checking to see if there is food in your teeth. I wanted that beautiful aged look. I thought about painting the frame, but for now, I am loving it as is! I like the way the shape works with our tapered fireplace. 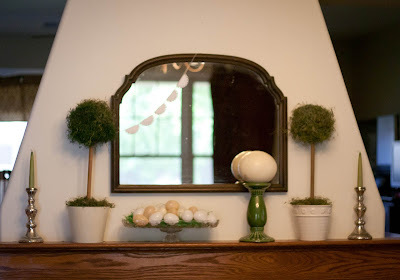 I’ve had the two topiaries for a while (I spray painted one of the pots a while back, so they would look a little more like a pair), and felt that they could provide the height achieved in the inspiration mantel. 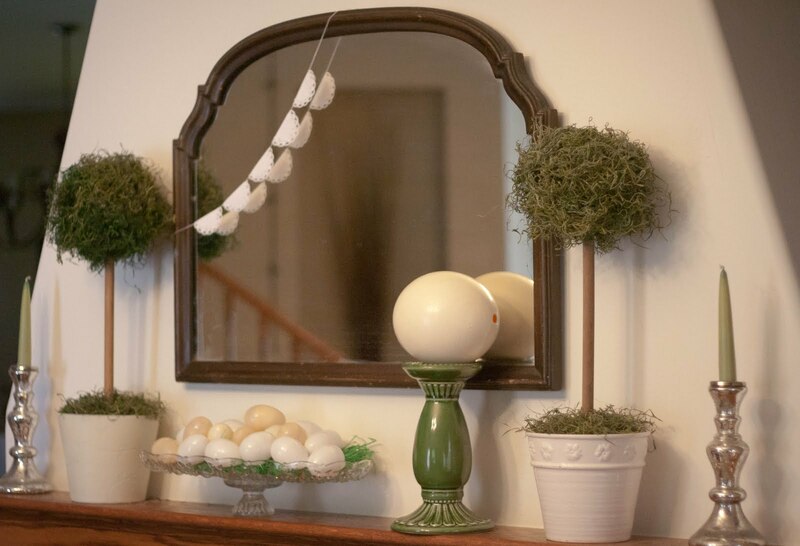 The egg on the green candle holder is an actual ostrich egg, that was hollowed out and given to us shortly after we were married. I thought it a random gift at the time, but have since been to an Ostrich farm and seen what people charge for these eggs! It often makes it’s way into my decor. 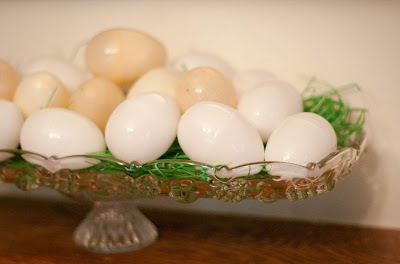 To replicate the low-lying platters of eggs in the inspiration picture, I placed a glass cheese platter on top of a candleholder, filled it with some of that “grass” that is made from wood shavings, and loaded on the plastic Easter eggs. If I had had more time and money, I probably would have decoupaged, or painted eggs, or something, to hide their plasticness (spell check doesn’t like that one!). But I’m throwing an Easter party at church with zero budget, so we need every plastic Easter egg we can find for that one. I just sorted through to find the most natural colors of the bunch, and from a little distance, they really aren’t too plasticky (dictionary doesn’t like that, either!). It’s amazing what happens when you forgo the neon pink eggs! I really wanted to dress up the mirror a little and balance out the ostrich egg, so I created this little doily garland with my Silhouette and plain printer paper. It had to work hard to make all of these tiny, intricate cuts. I did finish getting all the big pieces out, but figured you wouldn’t be able to tell if I punched through every hole or not. 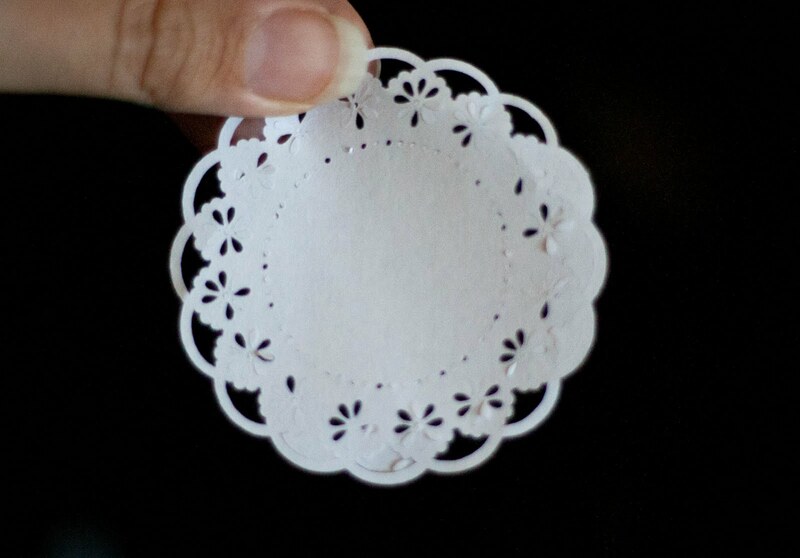 Then I just folded the doilies in half and glued them to themselves over the string. I had thought to put a word like “Spring” or “Easter” on them, but kind of preferred the more simple look. BSB on the other hand, didn’t get the garland at all. Someone needs to explain to him that grannies are chic again! While I was enjoying the calm mono-chromatic feel I had going, I thought it might need a punch of color and since our neighbors had brought us some roses from their garden, I figured that would do the trick. 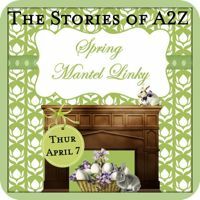 Linking to The Stories of A to Z, if I’m not too late! I love it with the splash of color! Beautiful! 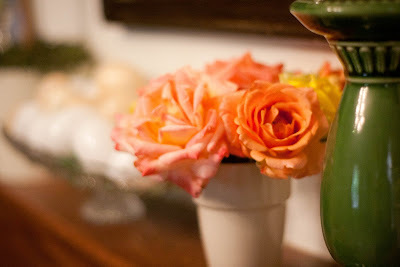 So glad you made it to the party and I'm loving your roses (and the fun ostrich egg)! Love love love it! great job! I love the look of the flowers. 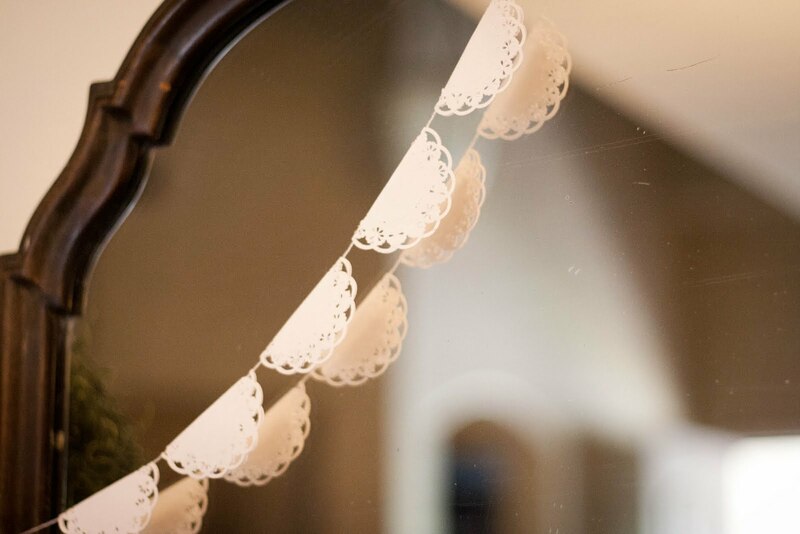 It's lovely- and that mirror is perfect for your mantle! 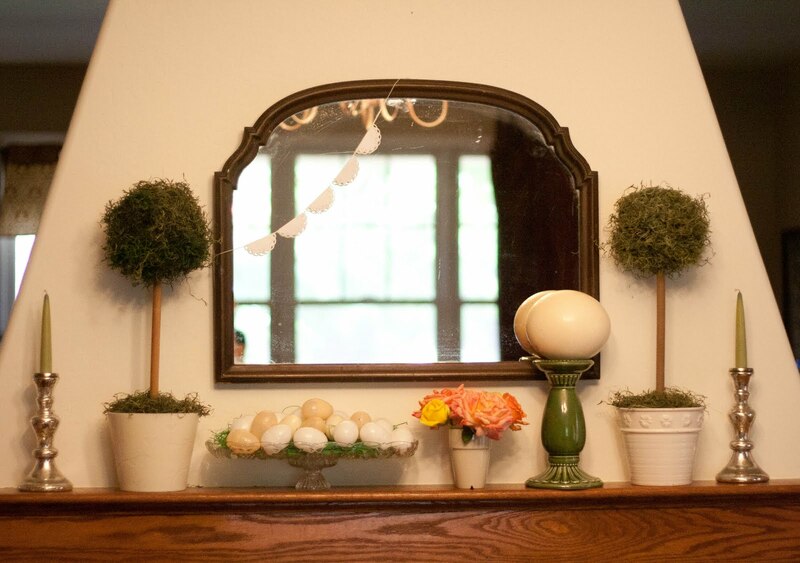 I love how soft and relaxed your mantle is! Love all the green and white in your mantel. 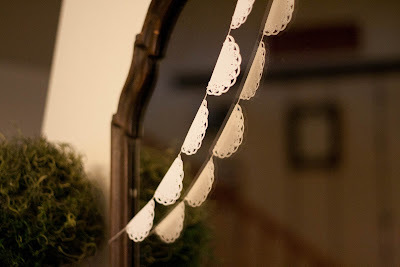 The mirror is absolutely gorgeous! Stopping by from CSI. 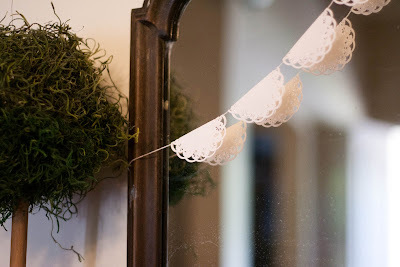 The doily garland is my favorite!